Ever since Irish independence in 1923, interest in royalty has been officially discouraged in the Irish state, and yet, many ordinary Irish people remained fascinated by the Crown, secretly collected memorabilia about coronations and other royal events and often saw no contradiction in having a picture of Michael Collins next to one of the Prince of Wales in their kitchen or parlour. The Irish state still remains aloof from British royalty – the Republic of Ireland is one of the few countries which Queen Elizabeth has never been invited to visit: the last visit by a British monarch to Dublin was George V in 1911. In a much-praised historical narrative, Mary Kenny – drawing on research at the Royal Archives in Windsor as well the Irish archives, and personal reminisce by a number of people – examines the complex and contradictory relationship between Ireland and the Crown. Ireland often had the effect of bringing out the essential personality of the English monarchs: Victoria’s reaction was typically volatile – now she loved the Irish, now she detested them: Edward VII, tolerant in religion and lover of the turf, was probably the most popular of all monarchs in Ireland: George V was anguished over Ulster, but painstakingly tried to be fair about Home Rule: and Edward VIII, because of a quirkey constitutional anomaly at the time of the Abdication, was said to have remained legally King of Ireland until his death in 1972 (and Wallis, technically, Queen). Mary Kenny has found a fresh niche in Anglo-Irish history, that is, through the relationship, political, popular – and personal – which involved the monarchy. It is a story full of narrative, the human touch, and sometimes humour. Crown and Shamrock is published by New Island Books in Dublin on 27 August 2009.
at Killeen Communications in Dublin. Mary has lectured widely on subjects associated with Irish history and culture, and would be happy to give a talk on the themes and narratives in Crown and Shamrock. “Her research is prodigious, and so is her memory…The personal viewpoint, tempered by the passing of time, gives to the book a great deal of interest and appeal. Her innately good instincts are reinforced by the good journalist’s proper research into facts.” Bruce Arnold, Irish Independent. “The author makes skilful use of family lore and other, often neglected sources to highlight the private responses of many Irish Catholics to the monarchy, which were often more ambivalent than the stark statements of their leaders. She rejoices in the quirkiness and the absurdities that have pervaded the conflicts of Irish life and British-Irish relations. Throughout, she displays the engaging individuality and the eye for an entertaining detail ….not an easy book to put down.” Charles Lysaght, The Tablet. “Mary Kenny’s essential thesis in this thoughtful book is that popular Irish attitudes to the British monarchy, while formally based on the acceptance of a radical republican repudiation of the Crown as a link between Britain and Ireland, in fact contain beneath the surface a good deal of what is known in Ireland as ‘a sneaking regard’. .. a valuable survey laced with interesting anecdote and builds on a dialogue with scholarly historians such as James Loughlin and James Murphy.” Lord Paul Bew, Literary Review. “Here is recent history as it ought to be written, analytical but also human, packed with factual material but spiced with gossip, a grand read but calculated to do good by reminding us that the Irish, no less than the English, enjoy the personal and ceremonial side of monarchy and that royal visits to Ireland have almost invariably been successful.” Paul Johnson, Catholic Herald. “Her material is..particularly insightful and entertaining on Edward VII and George V….Kenny’s account of Edward’s 1904 tour of the west (of Ireland) in Panhards, Daimlers and a Cadillac – being greeted by 100 men on Connemara ponies at Recess and a welcoming banner at Tully ‘Friend of Our Pope’ is one of the book’s many high points….Mary Kenny has done a thorough job of filtering out fascinating material from specialist publications and spicing it up with her own findings in the archives and her own recollections….Solid, thoughtful and eminently readable book that provides a highly original take on the rocky relationship between Britain and Ireland.” Jonathan Bardon, Irish Times. “She combines lightly worn but deeply researched scholarship with immense readability. 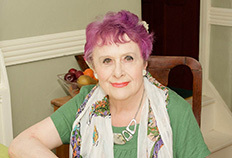 As always Mary Kenny has a wonderful eye and ear for the details.” Peter Costello, Irish Catholic. “Ms Kenny’s speculations are insightful and shrewd, such as her suggestion that we Irish suffered from the loss of pomp and pageantry that went with the monarchy, and that our transferred ‘loyalty’ buttressed our love for the Church. Such intelligent speculations, assured style and the spangling of the text with informational gems make this a fine book, well researched and eminently readable.” Margaret Carragher, Sunday Independent. “By concentrating on an unusual subject – and through her formidable researches at the Royal Archives at Windsor – the author has succeeded in throwing a spotlight onto one of the darker episodes of recent British and Irish history. In doing so she has illuminated a fair slice of murky material, not all of it creditable to the powers-that-be of what used to symbolise a two-part kingdom.” Anthony Howard. Daily Telegraph online. “She made good use of her time in the Royal Archives in Windsor and her purpose throughout is to retell the story of Anglo-Irish relations through the prism, so to speak, of the Crown. She achieves this in captivating fashion and students of Irish history will not only enjoy but will learn from her work.” T.P. O’Mahony, Cork Evening Echo. “Kenny has managed to knit together a broad range of people and events into a coherent, readable and at times amusing narrative. She has brought to the task the eye of an experienced female journalist, ever seeking the ‘human angle’ as most likely to appeal to people.” Thomas J. Morrissey SJ, Studies Quarterly. “Mary Kenny is one of the outstanding writers of her generation, and writes about Ireland’s complicated relations with the British monarchy with all her usual verve and perception”. Sir Max Hastings, writer and historian. 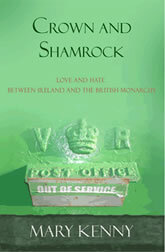 Crown and Shamrock can be ordered through all bookshops. In London, it is available at Hatchards of Piccadilly.